Hailing from the culturally–diverse and economically–depressed anthracite coal mining region of Northeastern Pennsylvania, David Hage performs under the epithet Coal Minor Canary. The name references the canaries that were used in area anthracite coal mines to warn miners of deadly gasses so they could evacuate as a metaphor to passionately share his songs with listeners. His style merges a combination of travis picking borrowed from regional folk music with progressive fingerstyle guitar, alternate tunings, and percussive techniques paired with ethereal effects and looping. Coal Minor Canary is the epithet used by Northeastern Pennsylvania-based musician, David Hage. The name borrows reference to canaries used well into the 20th-century as an early-warning signal to coal miners so that they could escape the mines before carbon monoxide, or methane gasses reached lethal levels. 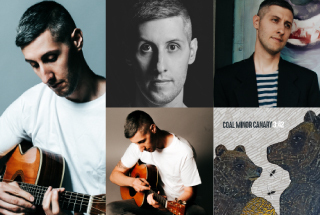 Hage metaphorically uses the name Coal Minor Canary to convey nuances of experiences that are not adequately detectable through any other means other than the immediacy, sincerity, and intensity of his music. Coal Minor Canary’s musical style is uniquely his own; mixing travis picking borrowed from regional folk music with progressive fingerstyle guitar, and percussive techniques accented by layers of ethereal effects and looping. His lyrical exploration is personal and passionate and often paired with rich alternate tunings and sparse melodic arrangements that define his dusty black diamond music. Hage’s grandfather who was a jazz drummer and music teacher, and he was raised in an environment with parents, and other family members were musically inclined. He is a Ph.D. student in gerontology and views helping others much like the process of writing a song and employs similar passion and creativity in both arenas. After having experienced a relationship coming to an end, coupled with the cumulative effects of taking a break from his creativity; he had no choice but to write his debut EP, 342. For booking, press, or general inquiries, email david@coalminorcanary.com. Thank you for your interest in Coal Minor Canary’s dusty black diamond music!